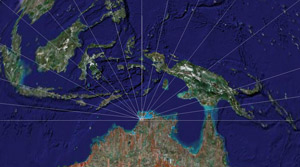 Charles Darwin University is pleased to announce the recent development of a website which provides a gateway to information on the University’s activities in Indonesia and Timor-Leste. Special Project Leader, Janet Russell said ‘The website has been designed to demonstrate the extent of the University’s involvement and capabilities for working in the region. For more information or if you would like your work included please contact Janet Russell on 8946 6044 or at janet.russell@cdu.edu.au.